DGD Series cartridges are manufactured from 100% pure polypropylene and are sized for use in Big Blue® Filter Housings. DGD Series cartridges are designed for purity and will not impart taste, odor or color to the liquid being filtered. Additionally, the polypropylene construction provides superior chemical resistance and is not prone to bacterial attack. Reasonable price. Good customer service when errors occur; and they occur frequently. Of the three orders I've placed, two have either been back ordered without any indication at time of purchase, or only half the order shipped. That said, when queried by email, a response was received quickly, and only once did I have to wait several weeks to receive shipment. 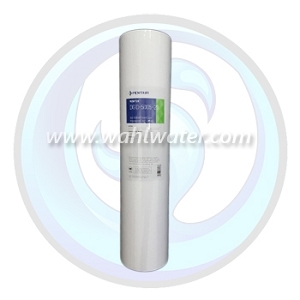 Wahl Water has excellent prices on filters, local retail or on the web. Plus, their shipping is super fast, free, and so convenient because now I don't have to run out to the store for filters! Q: What's the difference between the DGD-2501 and the DGD 5005. Presently using the 2501? A: The Difference is the Size of Particles Filtered Out. 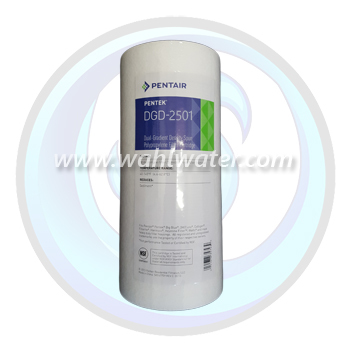 The 2501 filters down to 25 Micron on the outer portion and down to 1 Micron on the inner portion. The 5005 filters down to 50 Micron on the outer portion and 5 Micron on the Inner.